For the past 40 years, Porsche Design has epit-omised functional and puristic watch design. The ornamental elements of the luxury brand's timepieces are limited to the hands, the minute markings and clear writing on the dial. Professor Ferdinand Alexander Porsche, who founded Porsche Design, had no interest in decoration for the sake of decoration. For him, the aesthetics of a product arose from considering form and function as equal partners. 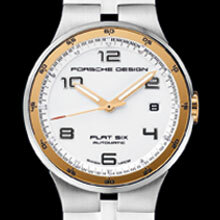 The new Por-sche Design P’6300 Flat Six watch models adhere to this design philosophy. The three-hand timepieces, the P’6350 and P’6351, are available in two sizes for the moment, one suited to a delicate female wrist, the other to a larger male wrist. These new watch models and the P’6360 chronograph are available now world-wide in Porsche Design boutiques as well as at authorised retailers. 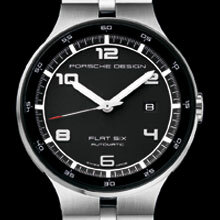 All three watch models are classical with very straightforward lines in typical Porsche Design style. As with the previous models, the new Flat Six timepieces were inspired by the puristic appearance of the sports car dashboard instruments. The watches’ broad hands point towards equally broad markers, so even a quick glimpse is all that’s needed to read the time accurately. White or black luminous mass help with reading in dark conditions. The ten new models are distinguished by their frugal col-ours, black, white, grey, yellow and red with two exceptions: black dial with red or orange scale and hands. The only difference between the two three-hand watches, the P'6350 Automatic and the P’6351 Automatic, is the diameter of the case, namely 44 and 40 millimetres re-spectively. All timepieces are of the same height, 11.25 millimetres. The date is displayed at 3 o’clock. The hands are driven by a Sellita SW200 calibre boasting a 38-hour power reserve. The balance has a frequency of 28,800 beats per hour. The models are available with ten different dial versions, various cases and watch straps. The watches are all water-resistant to 100 metres. 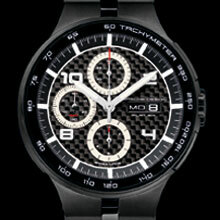 The dial of the Porsche Design P’6360 Flat Six Automatic Chronograph has been designed differently. Three subsidiary dials are positioned on the left-hand side: a 30-minute counter at 12 o’clock, a 12-hour counter at 6 o'clock and a small second dial at 9 o’clock. At the 3 o’clock position are two openings, one for the weekday, the other for the date. Even the small scales on the totalisers are easily readable, since the watch has a diameter of 44 millimetres. A tachymeter scale has been engraved on the bevelled inner bezel. It can be used to measure speeds of 50 to 330 km/h. Time is kept by an ETA 7750 chronograph movement with a frequency of 28,800 beats per hour. When not worn, the watch has a power reserve of 42 hours. The case and watch band are in shot-blasted and polished stainless steel, or in shot-blasted and polished PVD-coated stainless steel. The watch strap comes in black or white caoutchouc. Porsche Design is a luxury brand that focuses particularly on technically inspired products. The brand was launched in 1972 by Professor Ferdinand Alexander Por-sche. The products epitomise functional, timeless and purist design, and they fascinate with their technical innovations. All the brand’s products are designed at the Porsche Design Studio in Zell am See (Austria) and are distributed world-wide in company boutiques, franchise stores, shop-in-shops, high-end department stores, at exclusive authorised dealers, as well as official online stores. Mat-finished and polished stainless steel, black dial, mat-finished and polished stainless steel strap with folding clasp. Mat-finished and polished stainless steel, white dial, white caoutchouc strap with pin buckle.